Leaders join protest against ICE arrests in Fairfax Co.
Sen. Tim Kaine and other lawmakers recently spoke at a church where several people leaving a hypothermia shelter were reportedly arrested by Immigration and Customs Enforcement. WASHINGTON — Several people were reportedly arrested by Immigration and Customs Enforcement last month as they left a hypothermia shelter operated by the Rising Hope Mission Church in Fairfax County. On Thursday, local, state and national lawmakers gathered at the church, just off U.S. Route 1 near Mount Vernon, to show support for immigrants and demand change. Immigrants, Kaine said, are typically law-abiding people who are more likely than the rest of the population to become crime victims. “They need to feel comfortable interacting with our law enforcement professionals. If they do, it will make the entire community safer,” he said. “We’re here to make sure the remarkable, resilient, inimitable fabric of our nation of immigrants is not destroyed by the scorched-earth tactics that have come out of this recent administration,” said Rep. Don Beyer, who represents the state’s 8th District in Congress. Beyer is co-sponsoring a bill to ensure current guidance is followed so that ICE raids don’t happen near “sensitive” places such as schools, churches and courthouses. An ICE spokeswoman has said the arrests were made across the street from the church, which complies with its policy. 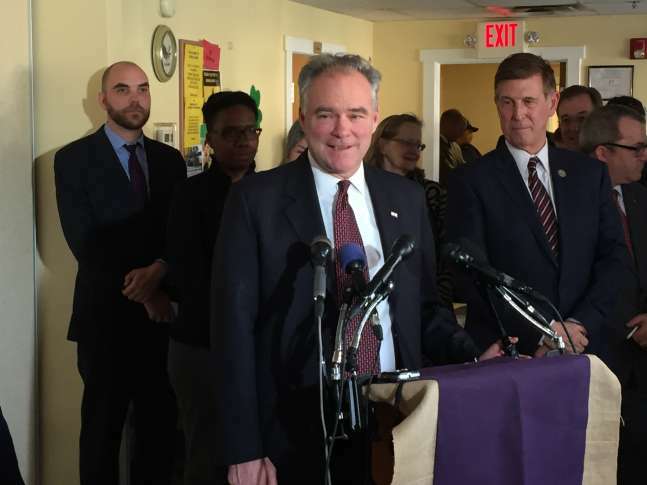 Both Kaine and Beyer spoke about a need for comprehensive immigration reform. “We need to find out if any laws were violated, whether these arrests were legal, and we’re still investigating,” said Nicholas Marritz of the Legal Aid Justice Center, which works directly with the immigrant community. “ICE has refused to give us the information of the names of the detained or an accounting of what exactly happened here,” he said. A local community activist who had planned to speak changed her mind when she heard about a woman in Mississippi who was reportedly arrested by ICE this week after speaking at a press conference put on by immigration advocacy groups. Instead, the activist, who uses the pseudonym “Maria Ruiz,” joined the event via speakerphone.